Last night as I was getting ready to sleep, I noticed that despite it being 23:50 the fireworks were still going strong and it might be a bit hard to fall asleep. I pulled out my phone and took a two minute recording. This is unedited other than to strip off the video and convert to mp3. At MinneBar, at least two people were trying to set up collaborative waves on Google Wave, but didn't know how to add Public so anyone could access them. As the UI for doing so is quite poor and text instructions ended up with me being added and then adding Public myself, I thought I'd throw up a couple screen shots. 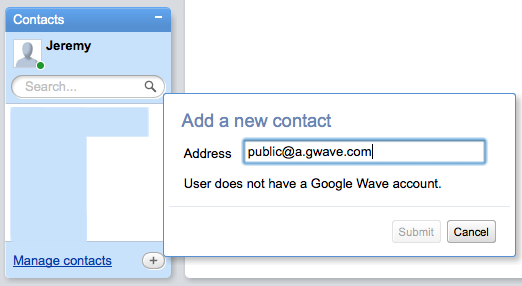 First step is to choose the + to add a contact, and type public@a.gwave.com. The system will report "User does not have a Google Wave account." Ignore the lack of active buttons, and just press Enter on your keyboard (while the text cursor is still in the Address box). 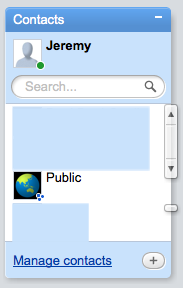 Public should now appear on your Contacts list and can be added to waves as desired. Note that it is only retained in your Contacts list until the current wave window is closed, so this procedure unfortunately needs to be repeated for each session in which you want to make a wave public. A wave can be shared by just copying the URL as you view it, and sharing it with anyone who has access, which in the case of a public wave is currently anyone with a Google Wave account. Besides being π Day, today was also Make: Day at the Science Museum of Minnesota. In a collaboration with Make: television (which is from TPT), individual and community-made projects were displayed around the museum. I think my favorite quote from the day was when a little kid pointed to a tabletop trebuchet and John Park said Oh, it's perfectly safe. Push down on it as hard as you can. A small beanbag was quickly launched at head level through the crowd. For exhibits, there were plenty of robots from Twin Cities Robotics Club, as well as some robots from a high school. Both apparently have competitions somewhat regularly. Kinda like Battle Bots, but in just achieving a goal (push the other one out or shoot baskets from an unknown but likely slick surface) rather than destroying other robots. One exhibit was Tripoli Minnesota High Power Rocketry Club, which unfortunately didn't have any actual rockets there (given the size in photos, they wouldn't have really fit). As one of the guys said while handing us a flyer, Rockets for big boys . They have a launch day on May 9 from 9am to around 4pm, which could be an interesting event. A prominent line on the brochure is Spectators Welcome — anyone interested in going to watch on May 9 or one of their other scheduled dates this summer? The Flash & Glow exhibit was rather interesting. It was very interesting material to play with, but unfortunately does not appear to be cheap. The 3D printing and many audio devices were interesting as well. Links to the different projects are available on the Make: Day site. I did take photos and video of Make: Day, and also threw together a short video of the photos. Enjoy.